A sparkling set of stainless steel utensils can change the beauty of your kitchen. The polished finish, excellent durability and corrosion resistance makes the stainless steel utensils perfect for regular kitchen use. Let us checkout the top 5 utensils which are must have. 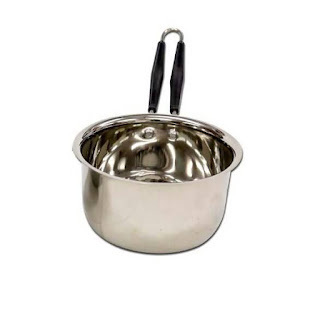 Sauce pans are associated with the morning of every Indian. Preparing tea and coffee, boiling milk or water is not possible in an Indian household without a sauce pan! This is the easiest way to perform the above mentioned tasks because sauce pans are hollow with enough space to heat up large amount of liquid. These stainless steel utensils are available in small, medium and large shapes to suit the requirement; the large sauce pans can be used to prepare rice, pasta or even tomato sauce. • A round bottom which distributes heat evenly at every part of the pan. • Special bottom which is compatible with both gas ovens and induction cooktops. 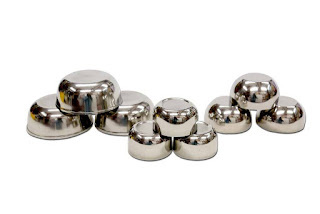 • High grade steel make so that food prepared in it is chemical free. • A long handle which remains cool even when the pan has boiling liquids. From extracting that one scoop of yummy pickle to estimating the amount of sugar in tea, a spoon is a multipurpose kitchen utensil/ cutlery for us. The spoon sets are available in different sizes and carvings. While some are in simple design and are apt for regular use, others are finely carved and can be used on festive occasions. Stainless steel spoons can be classified as table spoon, coffee spoon, dessert spoon, soup spoon and sundae spoon. Also termed as handi or pots, these stainless steel cooking vessels are an integral piece of any Indian kitchen. From preparing that pure desi tarka to yummy vegetable curries, no utensil can replace stainless steel urli. 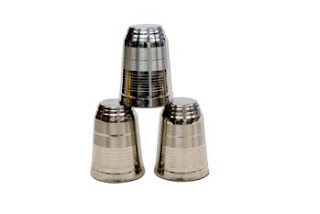 Urli or handi is also an ideal stainless steel set which can be used to serve food. Besides the traditional use of cooking, use the urli to light floating candles or serve fragrant flowers. The stainless steel bowls are another must have in an Indian kitchen. These bowls can be used to serve snacks like potato chips to soup and curry. Indians are known to have a variety of cuisines at lunch or dinner; bowls make it easy to serve the dishes. 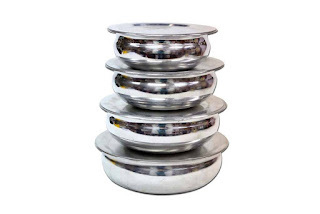 Stainless steel bowls enhance the grace of your dining table. Glasses or stainless steel tumblers, an Indian day is incomplete without these utensils. From siping a steaming hot cup of coffee to quenching your thirst with cold water, stainless steel glasses are the must haves. Stun your guests by serving lemonade, water or coffee in these royal stainless steel glasses. 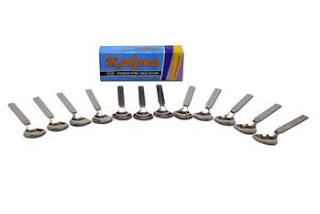 These stainless steel utensils are available as separate kitchenware and also as a complete thali set. So buy some for your kitchen today to give it a silver shine, which comes from BPA free stainless steel.